Many of us have heard that being too acidic is not great for your health. From digestive issues including excessive stomach acid, reflux, gastritis, ulcers, dry skin, cracks in the corner of your mouth, thin and easily cracked nails, sensitive gums, mouth ulcers, fatigue, muscle cramps, sore eyes, anxiety and depression – the list is not good. 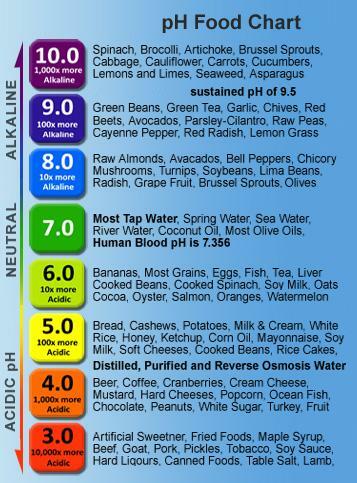 The foods that cause a tendency toward acidity have been documented, however the lists are a one size fit’s all approach to pH. It’s not so much about the pH of the food before you eat it, it’s all about how it affects your blood after digesting – and that varies by blood type. Meat might be an “acidic” food, especially for A and AB blood types. However it’s effect on O and B blood types is minimal. Wheat is acidifying, but that effect is stronger on some individuals (such as O’s) compared with others (such as A Secretors). Sugar we KNOW is acid forming. Dr. D recommends that some of us avoid sugar completely and the rest of us keep it to 1 or 2 teaspoons a day. Lemon in water is alkalising (even though lemon juice is acidic before being digested). Lemons and lemon in water is “highly beneficial” for everybody on the blood type diet. My suggestion is that you stick with your own food plan (secretor or non-secretor) – your list of foods, your serving sizes and frequencies – and stop worrying about the acid/alkaline balance separately, as it has been taken into account based on the individual responses to individual foods.